Dr. Elaine Ostrander's lab at the National Institutes of Health is trying to understand disease susceptibility, behavior, and variation that occurs throughout domestic dog breeds. Her team works with dog owners, breeders, and the American Kennel Club to collect DNA samples from dogs of varying phenotypes and applies the most sophisticated genomic technologies to understand variation in behavior, morphology and disease susceptibility in these breeds. They also lead The Dog Genome Project. Using saliva samples to gather dog DNA, this research helps us understand the genetic underpinnings of the same or similar phenotypes in humans, highlighting mutations, genes, or pathways important to developmental and disease processes. Dogs are ideal for such studies since each dog breed represents an isolated and relatively pure breeding population, dog families are larger—much more so than humans, and dog owners ensure the health of their pets by vigilant screening on the part of a highly motivated veterinary community. Dog are domestic pets that also share many of the same environmental exposures as humans, which helps us to understand gene-environment interactions. Below are helpful online resources for coming up to speed with the dog genome and its promising findings chosen to help both teacher and student. These include a recent videos of Dr. Ostrander presenting her findings, important published research, and powerful images for use in talks or handouts. 1: Video 1: "The Dog Genome: Shedding Light on Human Disease. "Presentation to a public audience at the Smithsonian Institution (2014). 2: Video 2: "The Shape of Things: Complex Genetics in the Domestic Dog" (with captioning). National Institutes of Health lecture (2011). 3: Video 3: "Dog Genomics and Dogs as Model Organisms." Using dogs in genome-wide association studies (GWAS), and the genetic evidence for dog domestication. 1: "Both Ends of the Leash — The Human Links to Good Dogs with Bad Genes." New England Journal of Medicine (2012). 2: "Going To The Dogs." The Scientist (2008). 3: "Genetics and the Shape of Dogs." American Scientist (2007). 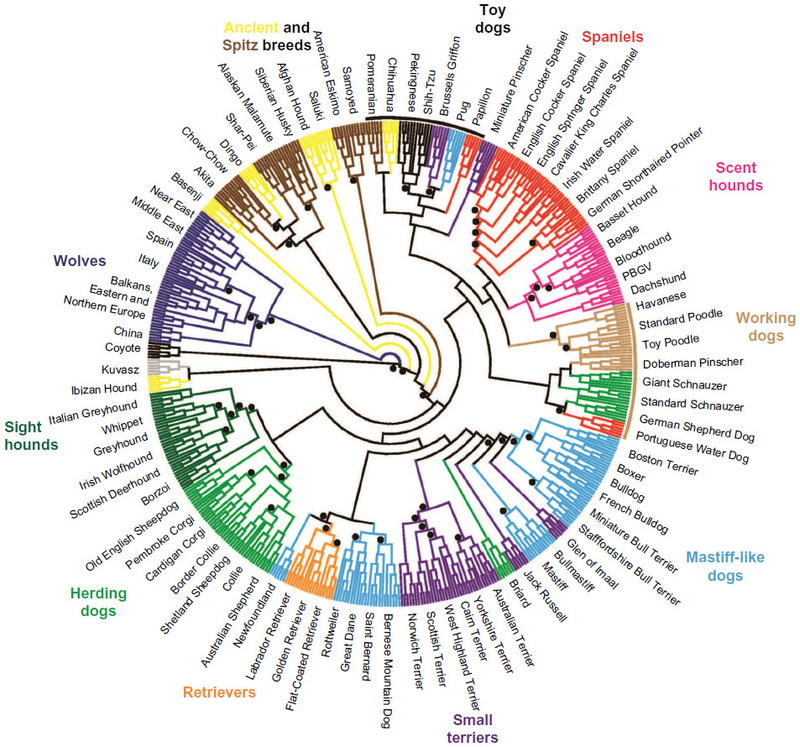 4: "The Canine Genome." Cold Spring Harbor Press (2005). 5: "From Caveman Companion To Medical Innovator: Genomic Insights Into The Origin And Evolution Of Domestic Dogs." Advances in Genomics and Genetics (2015). 1: Canine Evolution Cladogram (High quality illustration). 2: Journal of Nature Cover: The Dog Genome (Several dogs staring at an image of Watson and Crick explaining the DNA molecule). Same image, not in cover format. 3: Science Magazine cover: Large and small dogs side-by-side. (Harlequin great dane and chihuahua). 1: Genetics Primer for Dog Owners (from Ostrander researcher group). 2: The NHGRI Dog Genome Project Home Page. 3: Information for Dog Owners: How You Can Help. 4: Lists of Needed Breeds for the Dog Genome Project. 5: Dr. Elaine Ostrander's Research Group at the National Human Genome Research Institute. 6: From the HHMI BioInteractive, a hands-on genetic mapping activity where students identify single nucleotide polymorphisms (SNPs) correlated with different traits in dogs.